My novel The Bride Stripped Bare By Her Bachelors, Even begins with my narrator Isaac becoming obsessed with an ivory statue of Abraham, his son Isaac, and an angel, which he sees in a small museum devoted to Germanic art at Harvard University, the Busch-Reisinger Museum. At the bottom, stands a thick, almost squat Abraham. He raises himself up on two massive, short muscular legs topped with immense powerful hips, visible through the covering of his tunic, which is carved so fine that you can almost see the weave. 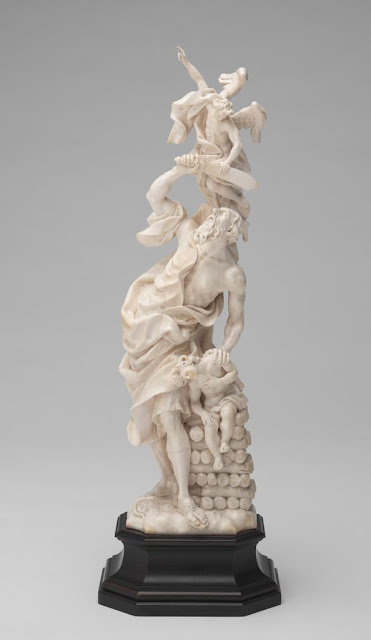 Following the cone of the ivory, his proportions get smaller towards his head, and he seems to stretch out vertically, as if to portray his yearning to reach up to heaven. His outstretched arms are very slightly too thin, too long for the rest of his body. In his hands, held high above him, he clutches an improbably tiny child, his unfortunate son Isaac, portrayed in the work as a doll-sized baby. In order to keep the carving contained with the natural limits of the available medium, the artist had to have Abraham twist his magnificently muscled body unnaturally as he rises up towards God. The fabric of his robe had to billow fantastically down from him, tight to his body because of the natural limits of the tusk, the fluttering of the rough wool cloth incredibly captured in the smooth hard cold cream. Flat on the the head of the baby doll son held up so high in Abraham’s mighty hands, almost too tiny to be believably part of the work, is another hand. It is the hand of a tiny buxom angel, carved from the very tip end of the tusk. Her tiny wings flutter out so lightly that the ivory there lets the light shine though. Tiny and nearly transparent herself, she seems hardly there at all. As far as I could recall, I had never seen an ivory statue of Abraham and Isaac at the museum (though I had been there). I had told many people, including a few friends in Boston who wanted to go and look for it, that it was a figment of my imagination. However, last week a friend of my mother's was organizing a book club at which they were going to discuss my novel. The friend sent my mother a note asking if the picture above was the ivory statue I had intended. Although the statue is clearly not identical to what I described, it is extremely close and it is part of the collection of the Busch-Reisinger Museum. Moreover, it was very familiar to me, so clearly familiar that I have no doubt I had seen and studied it before I described my fictional carving. I had somehow simply forgotten that it was real, and then re-invented it. When I saw the picture, I had the uncanny experience that my purely imaginary statue had magically materialized on earth, a strange but very wonderful feeling. I'm a research psychologist working in Edmonton, AB. In my spare time I write novel-length fiction and play with automated text generation (http://janusnode.com/). My first novel 'The Bride Stripped Bare by Her Bachelors, Even' was published by CounterPoint Press in spring, 2014 and is now available on-line [https://amzn.com/1619025493] and in your local bookstore.